There are three basic type of crab traps suitable for kayaking -- the popular Danielson box traps, traditional crab rings, and the collapsible Promar traps. Danielson pots retail for about $30 each. Crab rings go for about $15- 20 and Promar’s collapsible traps sell for about $20 each. They’ll all work well, but traps will usually catch more than the rings because there is less “dining and dashing.” However, one advantage of using rings is that you can carry many more rings than traps. I opt for the best of both worlds by using the Promar collapsible trap. It’s basically a box trap that you can transport collapsed until you’re ready to drop them. Important note – you need to add 4-1/4” rigid escape rings to the Promar traps to make them legal according to CA DFG regs. How much line do you need? I like to use about 10 to 20 feet more feet of line than the actual depth to accommodate tide changes and swell. Too little line and you can loose everything underwater at high tide. Too much line, and you could create a prop hazard for passing boats. It’s a good idea to bring along extra lengths of line so you can add if needed. To facilitate this, all of my lines have trigger clips on the end, so I can quickly connect or disconnect them from my traps as needed. I also bring extra 20 ft lengths of line with loops on one end and trigger clips on the other end. If I encounter deeper water than expected, I can quickly add more line. In the past, I used plastic bleach bottles, but I soon discovered that they just took up too much of my limited kayak cargo space. Plus, I learned that a float or buoy that’s too big has a tendency to “walk” your trap around in rough water. Now, I like using small sections of pool noodles as floats. The nice part is that they already come in bright colors, are cheap, and work well as a spool for your line. At night, it’s a good idea to use glow sticks zip tied to your floats for visibility. 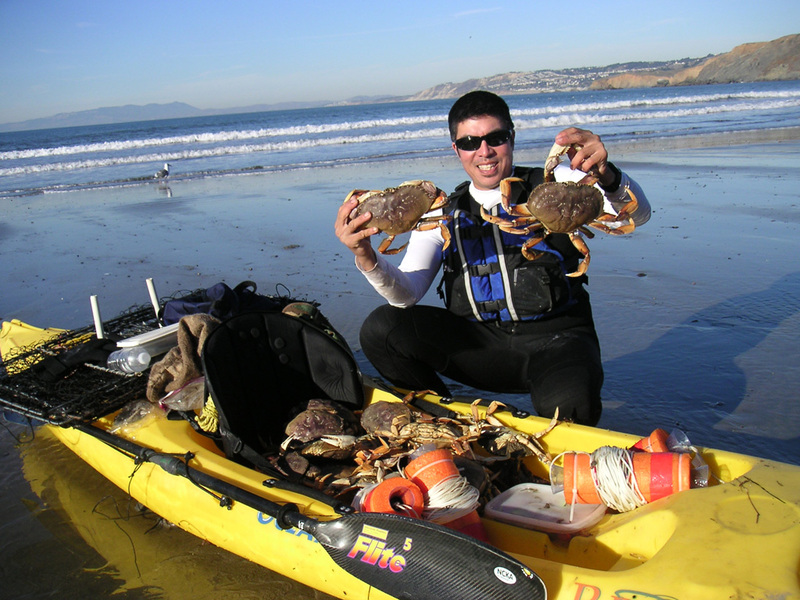 The biggest challenge in using your kayak for crabbing is transporting your traps without accidentally dumping them overboard in the surf or rough water. I came up with simple solution for less than a dollar. I used two 15” pieces ½” PVC tubing stuck into my rear scupper holes to serve as an upright racks to keep my traps from slipping overboard. For additional security you can add bungee cord to strap them down. Since crabs are scavengers, lots of different baits will work. One of the most popular baits is squid, but since I’m cheap, I just save my salmon and rockfish carcasses in the freezer during the summer. Given a choice, I believe crabs prefer oily fish like salmon or albacore to other types of fish. Some guys like using chicken parts. Last year, during the hunting season, I saved my pheasant carcasses, and I discovered crabs love that too. One suggestion that I’ve been meaning to try is pre-packing my bait in bait jars, cages, or net bags prior to freezing. This would make setting up prior to launching much less messy. Plus, frozen baits will retain their potency longer than thawed baits by milking slower. Unless you know the exact depths and bottom terrain, it’s good idea to have your depth finder onboard. It’ll help you find the nice flat sandy bottoms and avoid snags. If you’re targeting Dungeness crabs then sandy bottoms are ideal. If you’re hunting rock crabs then you’ll want to drop you traps closer to rocks and other structure. When you find a good drop zone, I’ll paddle up current a bit and begin lowering my trap slowly making sure that it lands right side up. Whatever, you do don’t let go of you line until you feel the bottom and know that you have enough slack line to keep your float above water. If I’m using several traps, I like dropping them at least 50 yards apart and letting them soak for a minimum of ½ an hour. I sometimes use different baits and soak my traps in different locations to figure out the most productive baits and locations that day. When it’s time to pull’em up, I’ll put on my thick neoprene gloves and begin paddling up current to my float, grab it, and begin pulling line up while letting the slack fall back in the water on the down current side to prevent a tangled mess on deck. If all goes well, you’ll have a bunch of crabs to pull out and check for size. Currently, the minimum size for dungies is 5-3/4 inches (4-1/4 for rock crabs) measured from end to end excluding the two points. Most crab gauges have a diagram showing where to place the gauge. But if you still have any doubts, check the DFG regs for current size limits and seasons. The safest way to handle crabs is by grabbing them by their two rear-most legs with one hand. If you do it right, it’s unlikely that their claws can reach your fingers. Once I get them out of the trap and know they’re legal, I throw them in my bag immediately. A wet sack or duffle can keep crabs alive for a long time. The first thing I do when I get home is to dump the crabs into the sink and start scrubbing them with stiff brush and rinse off any mud off the shell. Then I throw them in a big stock pot and add half a cup of salt, half a liter of water, and half a liter of Sprite, 7-Up, Squirt or similar type of lemon lime soda. Bring the pot to a boil and continue cooking for about 15 to 20 minutes. Turn the heat off and let crabs cool down. If you’re really impatient, you can dunk’em in cold water. Now, you’re ready for a crab feast!